The weather in California has changed over the years to the point that it actually feels a bit confused. At the same time that the corn is as sweet as sugar, we're also seeing sweet potatoes and apples popping up at the farmers market. It feels off to see these three foods in a seasonal baby food puree, but if you can get them fresh and organically, I say go for it. 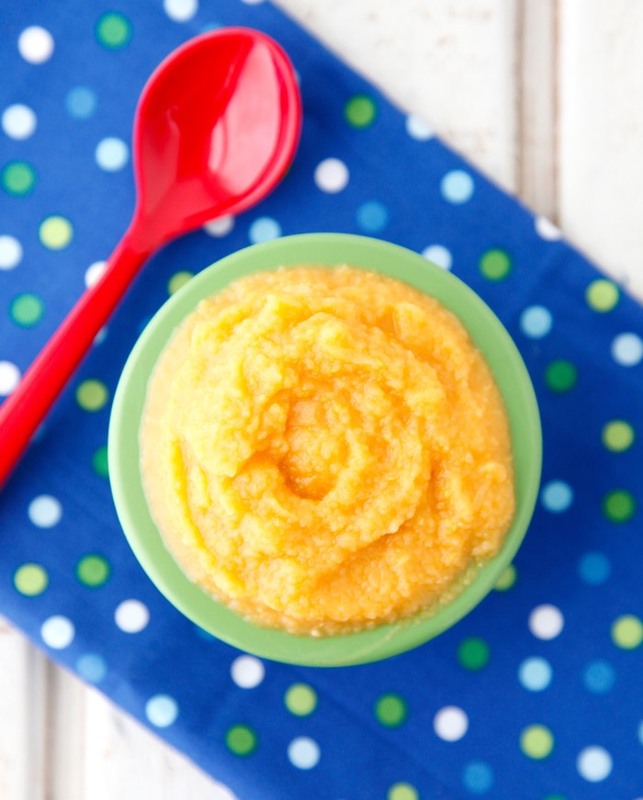 I made this Corn Apple Sweet Potato puree for Gemma this week to rave reviews. In baby world that means she ate the entire recipe over three days, so there was nothing to even freeze for a rainy day (not that we have many of those these days either). If you're like me you'll end up buying too many sweet potatoes and apples when they're in season, so you could try making this Coconut Sweet Potato Puree or a simple Apple Sauce. If you're still trying to figure out what to feed and when you can check out these ideas for introducing new foods. It's such fun when you move into mixing and matching foods to see what your baby enjoys most! 1. Place a steamer pot over boiling water and add the sweet potatoes. Cook for 4 minutes. 2. Add the apples and corn, and steam another 2 minutes, until the veggies are fork tender. 3. Transfer the veggies to a mini food processor and pulse until smooth, adding the liquid from the steamer pot 1 tablespoon at a time until desired consistency is reached.